Vice Picks Episode 3 !!! Vice Picks Episode #1. !!! Sorry I have not posted in a while!!!! Lots of Crazy stuff going on!!!! going to start doing these video posts for a while ! You don’t have to be a Cicerone to enjoy artfully crafted beer, a record producer to be moved by good music, or an Executive Chef to seek out the finest grub. Experiencing the best of the best is truly one of life’s great pleasures… but perhaps only if you have meaningful friends to share it with. Having your best friends and family around can make your backyard into the rooftop bar at the Ritz, turn a frozen strip steak into Wolfgang’s mesquite cote de boeuf, or even can make a twenty-dollar bottle of culty California taste like it might cost two-hundred. Now imagine what a true $500 bottle of one of Napa Valley’s most sought after wines might be like in company of the very best of friends. Sometimes in the hustle bustle of being a Sommelier and running a wine shop I get boggled down by ratings, pretension, and wine gobble-do-gook, What effect does unique volcanic soil of chalky white ash, a western facing slope, and 2582 degree days have on the body… what varietals should I be looking for? It gets tiresome. Sometimes the best way for me to evaluate wine and get a honest-to-goodness opinion is with my two best friends. Neither has the education or experience that I have, but they both have a discerning palate and an unaffiliated, honest perspective. The wine was Colgin “Cariad” 2006, the cigars, Cuban Montecristo # 3’s, the food, deep-fried peanuts and whisky sticks. The music was Creedence on vinyl and the Friends, a career hippie and dental school student (Doug), a petroleum engineer hillbilly (Alex), and me… Youngstown’s resident tattooed, smoking, sommelier. On the rolling slopes of St. Helena in Napa Valley, lies the Madrona Ranch. The distinctions here are essential in shaping the complexity of The Cariad. Most of the Cabernet Sauvignon, Cabernet Franc, and Merlot comes from this vineyard and certainly lends itself to the Bordeaux-Like structure and flavor profile. This wine has extreme terrior. While filled with earth and materiality, it completely displays the classic California fruit that you might expect from St. Helena. The Petit Verdot for the “Cariad” blend comes from Thorevilos Vineyard. Meticulous vine care and low yielding vines produce a Petit Verdot that adds the salt and pepper and the beautiful finishing notes in this outstanding wine. Doug typically likes his wine soft and well rounded. Ripe fruits and shy tannin are much more his style so it was no surprise to see Doug a little overwhelmed by the tannin and acidity in this monster. 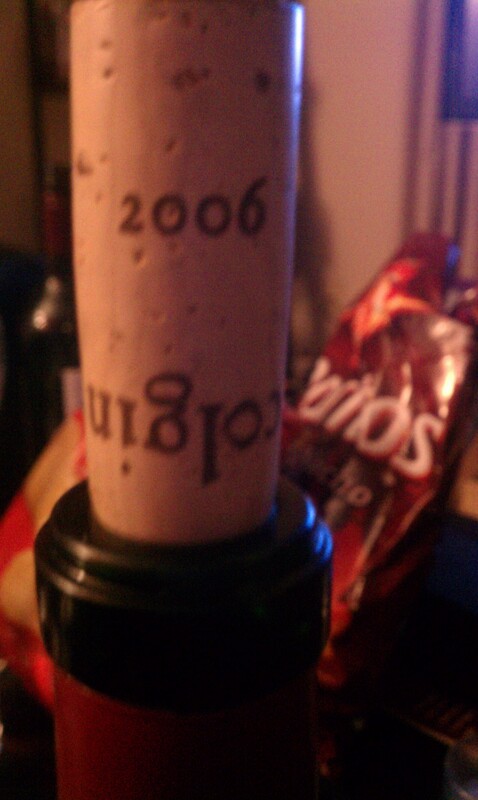 The wine was surprisingly well balanced for its youth. Most of these Cali big dogs take 15 to 20 years to develop the balance that this wine showed. And although it had the high tannin and acid, it compensated with 15.6 degrees of alcohol and a clever rush of strawberry and blackberry so bright even Doug eventually came out of his Caymus coma and began to really enjoy the complexity and power that brings this high flyer back to Earth. Now Alex typically likes his wine in the form of Budweiser, but has since lately been interested in learning about wine he has shown promise, as his palate is refined for not knowing it yet. As we drank and smoked he started talking about the venison, and deer jerky than he and his family had caught and made. Thinking about the venison as he talked, the gamey and roasty notes of the wine came to light and made me realize that a well prepared dish of venison or perhaps quail, or duck something gamey would be well matched with this beast. 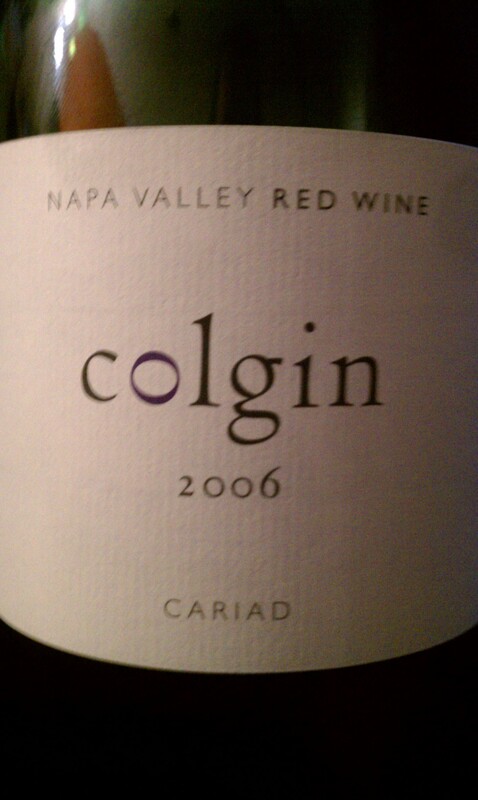 Colgin is a wine unlike most I’ve had before, the depth and complexity are “right there” as the tannin and acid are balanced now and will last for many years to come. Although we opened the bottle earlier than it may of liked, it still showed very well. At less than 500 cases, it was surely well tended too and artistically crafted. As the night continued on full of laughter and memories, I wrote down tasting notes, Alex talked about killing the deer with a bow and arrow, and Dougs teeth became a deeper and deeper shade of purple, I realized that it really didn’t matter what we were drinking, because the wine did its job, it created a moment in my life that I will never forget, a snapshot in time that I will remember forever, and that is what it is worth all the money in the world to me.